EQs or equalizers are among the most useful–and most commonly-used–sound processing tools in the audio world. They’re capable of brightening dull sound sources and tempering harsh and overly bright ones, it has near-limitless uses in studio and live settings. While EQ plugins like Fabfilter and Waves offer the industry standard and ease of use, there are a few great free alternatives you can try out. 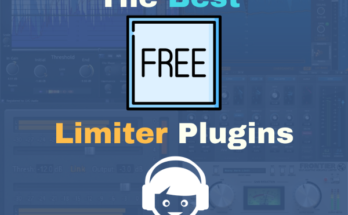 So in this article we’ll take a look at the best free EQ plugin software that money can’t buy! EQs work by cutting or boosting specific frequencies of a sound. Graphic EQs alter the sound in pre-set frequency bands, while parametric EQs provide more control over which bands–or range of bands–can be affected. Many plug-in EQs provide much greater degree of control than most hardware EQ units. Capable of ultra-precise cuts and boosts, plug-ins EQs make it possible to perform broadband sweetening or surgically-precise edits. Of course, some purists would insist that nothing comes close to the warmth and presence of a high-end analog EQ. But there is no denying that today’s modern breed of EQ plug-ins are capable of sounds that can be every bit as rich and satisfying. Cockos’ ReaEQ is an Infinite Impulse Response (IIR) equalizer plug-in that is capable of unlimited bands. It has many different filters options, including shelf, band, LPF, HPF, notch, band-pass, and all-pass. 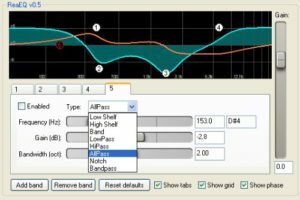 Like many graph-based plug-ins, it supports the use of the mousewheel for adjusting the bandwidths of individual frequency points. In actual usage, ReaEQ is a precise and transparent EQ that is versatile enough to stand up against even the priciest paid offerings. Like the much-lauded Pro Q by FabFilter, it lets you add as many bands as you need, allowing for precise EQing. Even if you already have a couple of go-to plug-ins in your toolkit, ReaEQ is well worth looking into as a solid all-rounder. Tokyo Dawn’s TDR Nova is billed as a “parallel dynamic equalizer”, although it looks pretty much like your typical parametric equalizer. Even so, there is considerable power beneath the familiar interface, with each of the four bands equipped with a comprehensive dynamics section. This enables the TDR Nova to go well beyond the capabilities offered by most mere EQ plug-ins, almost into the realm of the full-blown mastering tool. Even with its expanded range of capabilities, TDR Nova remains very easy to use. The drag-and-drop WYSIWYG interface invites creative tweaking, and there are even equal loudness features that help you make EQ decisions without being influenced by volume differences. 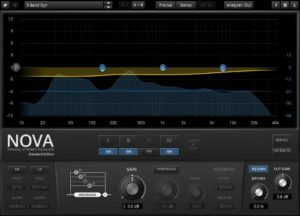 Overall, TDR Nova is a useful and versatile plug-in that is more than just an EQ. 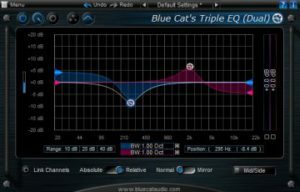 In contrast, Blue Cat Audio’s Triple EQ is an unabashed EQ plug-in through and through. A 3-band, semi-parametric design, it can also be used as a single highly customizable filter by linking all three filters. These filters–low shelf, high shelf, and boost/cut peak–work remarkably well together. Each is capable of wide gain and bandwidth ranges, providing all the tone-shaping you need for a multitude of tasks. Triple EQ has a helpful graph that provides visual feedback on the frequency response. There is also a dual-channel version that allows for independent left/right or mid/side processing. Somius’ SonEQ brings together the best qualities of the classic hardware EQ units in a convenient plug-in. A three-band EQ that provides control over the bass, middle, and treble frequency ranges, it also has high-pass and low-pass filters. There is even a preamp section with bass boost for added warmth and tonal control. Those familiar with the legendary Pulteq EQs will appreciate the SonEQ’s ability to boost and cut the low end at the same frequency. The preamp’s drive control is capable of a surprising range of sounds, from a slight edge to smooth saturation. With a warm and present tonal character that sounds great no matter where you set it, the SonEQ will be just as useful on your master buss as it will be on individual tracks. Tokyo Dawn’s Vos SlickEQ is another three-band EQ that cranks out great sound by the bucket load. Four modes are provided, each with a distinct curve and frequency response. The plug-in also has an auto gain feature that compensates for changes in perceived levels, so you can tweak settings accurately without being swayed by volume changes. What makes the Vos SlickEQ different from other EQ plug-ins is the output stage with four saturation models. The separate output drive control works in conjunction with these four models, producing different flavors of warmth and drive. This results in a varied array of sounds that is reminiscent of the character of vintage hardware EQs. 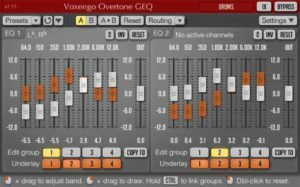 Voxengo’s Overtone GEQ is a seven-band graphic EQ plug-in that imbues your audio with pleasing harmonic content. It supports eight input and eight output channels for maximum tone-shaping versatility, and it handles mid-side processing with ease and elegance. Each of the seven EQ bands has its own harmonic enhancement module, which adds rich overtones to the sound. The combined effect result is subtle but striking, and it is especially impressive on sub-mixes and the master buss. Plugin Alliance’s SPL Free Ranger is a cut-down version of the Full Ranger EQ, with only four bands instead of eight. The good news is that it affects the most useful frequency bands, so you have a pretty good range of control over your sound. Like its big brother, the SPL Free Ranger is a remarkably musical-sound plug-in, with a crisp, clean sound that won’t change the basic character of your tracks. Although most of the other EQs in this roundup have more tonal-shaping capabilities, the SPL Free Ranger is a good choice for more basic EQing duties. With so many fine free plug-ins, it was quite a challenge to come up with one that could be called “the best free EQ plugin”. The TDR Nova and the SonEQ are capable of so much more than your average EQ plug-in, and the Overtone GEQ deserves credit for its harmonically-rich sound. But if there is one EQ that stands above all the others, it would have to be Cockos’ ReaEQ. With its unlimited band capability and the myriad array of filters, it gets our vote for the best EQ plug-in this time around.